Munther Amira had been arrested during a protest and then participating in a protest for the release of Ahed and Norman Tamimi in Bethlehem. Some of the evidence brought to court against Munther Amira included holding signs “rebuking the USA” and “the Balfour Declaration” and holding a sign with activist Ahed Tamimi’s picture on it. On Thursday, members of the Stop the Wall Campaign waited for his release and welcomed him back to freedom under occupation. 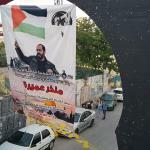 Munther has lost much weight during the six months due to the harsh prison conditions but the welcoming of family, friends and fellow activists has been a moment of joy during hard times of continues Israeli aggression. Israeli arrests have sharply grown in 2018. There are currently almost 5800 Palestinians in Israeli jails. Regular night raids are bringing dozens of Palestinians to Israeli jails every week.